VANGUARD CORPORATE USA - LONG BEACH, CA – Vanguard Logistics Services is pleased to announce the opening of its own offices in Hanoi & Ho Chi Minh City, Vietnam effective September 5th, 2017. The establishment of Vanguard Logistics Services Vietnam Company Limited will allow us to provide our full suite of services including import and export LCL consolidation. Expansion of Vanguard operations and brand into Vietnam is a continuation of Vanguard’s strategy to bring the highest performing and global reaching NVOCC network to our customers. 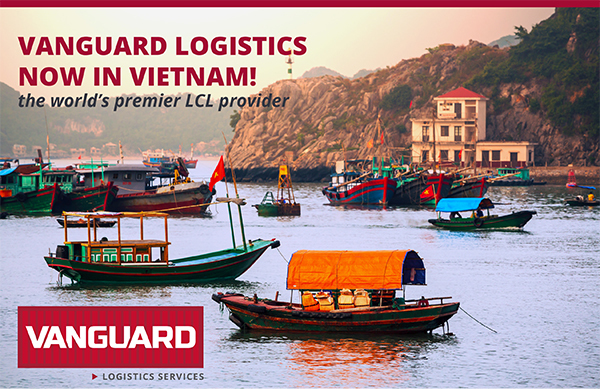 Vanguard Logistics Services has provided services in Vietnam through a branded agency arrangement for many years. We are now expanding the Vanguard brand, operations and network to the Vietnamese marketplace on our own. Given the importance of Vietnam as a strategic logistics hub, Vanguard is excited to bring our fully integrated services and solutions to our customers shipping into and out of the region. Vanguard is committed to continuing to deliver our outstanding services and seamless performance to existing and new customers worldwide.